Need to find a pet friendly hotel in The Grand Canyon National Park? Click the Pet Friendly Accommodations Button below!" 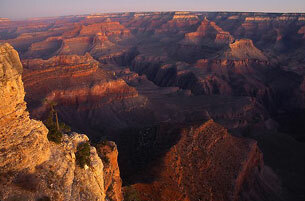 The Pet Friendly Grand Canyon is the most famous natural attraction in the USA and possibly in the world. No one forgets their first sight of the Grand Canyon and it will never fail to impress or offer something new. Most tourists see only the south rim of the Grand Canyon, because it is easily accessible and the main road parallels the canyon edge for some distance. There is every conceivable facility, many superb overlooks and a choice of hiking trails. The north rim, 215 miles away by road, is much more remote and high enough in elevation to be closed during the winter months by snow, but there are fewer people and the views are just as good. The only other part of the Grand Canyon that may be approached via paved roads is Havasu Canyon, although a day's hiking is necessary. Going on a hike is wonderful way to experience some of the canyon's rich natural beauty and immense size. 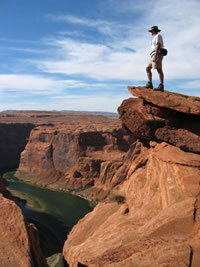 However, even if you are an avid hiker, hiking the Grand Canyon is very different from most other hiking experiences. Lake Havasu is both a water lover's paradise and a desert lover's dream. Visitors enjoy the top-rated RV resorts and condominiums with spectacular views and convenient locations. And, with more than 300 days of sunshine per year, Lake Havasu is ideal for golf, tennis and desert tours. More than 400 miles of stunning coastline will refresh you with exceptional watersports, including fishing, skiing, kayaking and houseboating. Or, if you prefer, explore the lake from the beautiful beaches, campsites and hiking trails. Visit http://www.golakehavasu.com/ for more details. There are a multitude of charming and pet friendly bed & breakfasts and small motels in surrounding towns where folks will welcome you and your well behaved pet. Check our pet friendly accommodations and services in Cameron,	Flagstaff, Grand Canyon, Kanab,	Page, Sedona, Tuba City, Tusayan, Williams. 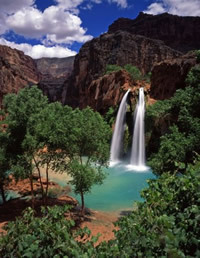 It's easy to find pet friendly hotels in the towns of the Grand Canyon with PetTravel.com. Just click the SEARCH button above for a list of pet friendly hotels, motels, bed and breakfasts, small inns, and vacation rentals in Livingston. We welcome your emails regarding pet friendly services in this region. Just send an email to info@pettravel.com and we will add them to our database. Come back often as we are always adding new and exciting places for you to visit with your pet. Traveling by Car? - We have lots of helpful hints and safety suggestions in the Travel by Cars, Trains & Public Transportation section. Need to book a rental car or reserve an airline ticket? CLICK HERE to compare prices with the click of a mouse! Need a pet carrier or crate for your pet? We have airline compliant pet carriers, IATA compliant cargo crates, pet microchips, microchip scanners, and more essential items for traveling pets in the Pet Travel Store.